Superstar artist Jim Lee returns to The Dark Knight with this painted issue! The impossible has happened and Batman is on the verge of being taken down by an enemy he cannot defeat: a virus for which there is no cure! And his only possible hope for salvation is The Joker! Who infected Batman, what does the Clown Prince of Crime know, and how will The Dark Knight get that information? Together, the enemies crisscross Europe, desperate to find answers before time runs out.<br />Co-conceived by Brian Azzarello (100 Bullets) and Matteo Casali and written by Casali, this 4-issue miniseries event will feature painted art by many of the industrys top talents over layouts by the incomparable Giuseppe Camuncoli (Hellblazer, Dark Wolverine)! 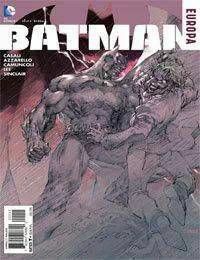 Future artists providing stunning overlay paints will include Diego Latorre (Dantes Inferno) and Jock (Detective Comics), with the first issue painted by none other than Jim Lee!